This upcoming weekend is Chautauqua, a time when a lot of out-of-towners descend on Madison to buy some art, eat some good food, and listen to some lovely music. And just generally to enjoy the pleasures of a September weekend in Madison. Personally, I plan on getting a great deal of my Christmas shopping done this weekend. With many non-Madisonians on their way, it seemed like a good time to post a set of Madison Rules, the informal norms of social life in downtown Madison. Every community has its own set of unique norms tailored to life in that particular locale, and Madison is no exception. DISCLAIMER: Of course, in no community is there perfect agreement upon what the rules are. What fun would that be? Most of these are very much my rules, but I understand that there are rules out there that are very much not my rules. I tried to canvas for a general sense of what rules folks would add, but I got no response, so feel free to comment with your own additions. Rule #1: Learn how to parallel park. Oh, the lost art of parallel parking! What was the hardest part of your driver’s license test? By far, the parallel parking, that insane part of the test which seemed so ridiculously old-fashioned and out-dated. Who parallel parks any more? The answer: downtown Madisonians. All the time. Almost every day. Learn this skill. Become an expert. You won’t regret it. In various conversations I’ve had with folks about downtown Madison, I’ve often heard the complaint, “There’s not enough parking.” I quickly translate this in my head into, “There aren’t enough parking spaces that I’m actually skilled enough to use.” Parallel parking is a quite efficient and time-tested provider of parking spaces in urban design. There’s plenty of parking in downtown Madison if you learn how to use it. Rule #2: Know when to open and shut your car door. If you become proficient at the above-mentioned parallel parking, and you do so on Main St., be courteous enough to wait until a break in the oncoming traffic on your side of the street before getting in or out of the driver’s side door. There is generally enough space on Main St. (though, see Rule #3) for three cars abreast–two traffic lanes and one car parallel parked along the street. There is not really enough room for the parked car to open their passenger-side door and disgorge a person while another car is passing in the right-hand lane. The good news is that traffic on Main St. in Madison is not really ever that heavy, and there are lots of traffic lights to create gaps in the traffic just perfect for getting out of your car without running the risk of being crushed or having your car door rather forcefully removed. This rule may very well mean that you have to sit in your car or stand outside of your car while you wait for the gap in traffic. Still, this seems preferable to me to the afore-mentioned crushing or loss of your car door, in addition to the difficulties it causes for the people driving down the street, who must either swerve into the left-hand lane to avoid you, or stop in the middle of the street until you are safely in your car and out of the way. If that isn’t incentive enough, think of that pause as a cosmic reminder to slow down…smell the roses…contemplate eternity, or perhaps just why you’re in such a hurry to begin with. Rule #3: Hug that curb. I once drove around downtown Madison with a friend from out of town who was not used to streets with cars parallel parked along the side. She wasn’t used to judging how close her car was to the parked cars and it made her nervous, so she kept veering out of the right-hand lane and driving in the middle of the two lanes. This made for a rather adventurous ride down Main St., where folks fully expect to use both lanes. There’s plenty of space on Main St. for three cars, as long as the car that is parallel parked hugs the curb. Exactly what constitutes “too far” from the curb is a delicate thing, but if you live in Madison long enough, you develop an intuitive sense for the proper distance. If you never learn how to parallel park, obviously you will not develop that intuitive sense, so your best bet is to drive around until you can find one of easier parking spaces downtown. Just don’t complain to me about how far you have to walk. Rule #4: Obey the crosswalks. Okay, so, yes, we are a small town, but even small towns need crosswalks, whose purpose is to tell people when they can and cannot cross the street. We live in a culture where few people walk anywhere anymore, so I feel it’s important to remind everyone exactly what a crosswalk is for. It tells pedestrians–those endangered creatures–when to cross the street. There are quite a few pedestrians in Madison, and so the crosswalks come in quite handy. Just as a refresher, a red hand on the crosswalk means to stop. Do not cross the street. 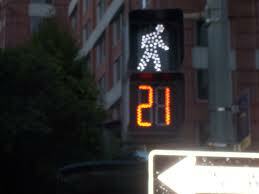 In Madison, our crosswalks most conveniently count down the amount of time in which you have left to cross the street. Some experience has informed me that to get across Main St., you really need about 10 seconds at least, assuming you’re not running. If you walk across Main St. when the hand is red, I cannot guarantee that you will not be hit by a car. Actually, I can’t ever guarantee that you won’t be hit by a car. But it’s infinitely more likely if you disobey the crosswalk. And even if you don’t get hit, you will find that you have made some people very angry. Because what are your actions saying? Yes, I see these basic accessories of civilization, designed to balance the needs of competing interest groups (pedestrians and motorists), and I scorn them. I make my own rules. I cross when I want. Your crosswalk be damned! Don’t you think such an attitude merits at least a little nudge from a large, moving vehicle? Rule #5: Yield to pedestrians. Your car weighs about 4,000 pounds, and at least currently, very few humans compare to that. So just yield, okay? Enough said. Except if they’re disobeying the crosswalk, in which case, you might give them just that little nudge. Rule #6: Respect the lawn chairs. Okay, this is specifically for out-of-town visitors. Yes, those lawn chairs or garbage cans or flower planters or sawhorses or whatever junk we could find in our garage–they’re sitting along the street next to the curb for a reason. To save our parking space, because, no, Mister, we do not have a garage. Well, okay, actually we do have a garage, but I think you would find it’s quite full of junk and not the easiest thing to get in and out of off a very narrow alley. And anyway, most downtowners do not have garages. We have the space in front of our houses, where we have learned to become excellent parallel parkers, which means we know the exact correct distance apart to set our two lawn chairs in order to reserve our very own parking space. Move these lawn chairs at your own risk. Is it legal to save a parking space for yourself in such a way? Is it fair? Is it right? Is it ordained by god? I don’t really care. But if you move the lawn chairs in order to park there, I really can’t be responsible for what happens. Rule #7. Enjoy. Following these simple rules will greatly increase your own enjoyment of our fair town, which, yes, is quite delightful. It will also keep you off the list of those who, all in all, we’d rather not come back. Thankfully, it’s a very short list.